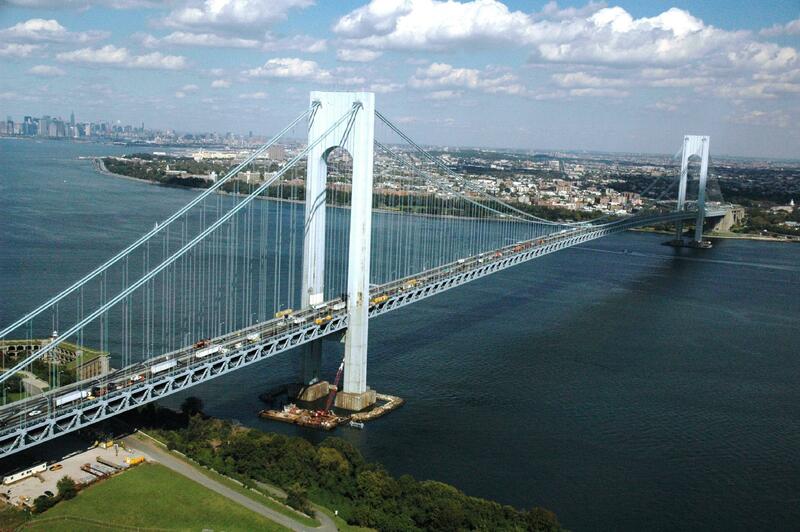 The two towers of the Verrazano Bridge are not parallel: they are slightly [???] to account for the curvature of the earth. The opposite of parallel is right, orthogonal, normal or perpendicular. But these towers are not the opposite of parallel, they're simply not parallel. So you could just say "not parallel". You could also say "at an angle to each other". Technically, parallel lines are at angle of 0, and 0 is a number, but people will know what you mean. You could also say they "diverge" or "are divergent". Here, it would be implicit that they diverge as one goes up. Use of a descriptive word along with "parallel" seems appropriate here - adverbs like almost, approximately, virtually, or visually. They "deviate" from being truly parallel. Example: Though virtually parallel, they actually deviate from parallel by 41.26 mm at top to correct for the curvature of the earth. "Angled". But, uh, in your picture it is clearly the pincushion distortion of the lens that is doing a much more thorough job of sabotaging parallelism than Earth curvature (the radius is something like 4000mi after all). And after pincushion distortion, there is perspective distortion. And of course you'd not make the pillars of a suspended bridge vertical anyway but angle them outwards so that the combined load of their weight and the rope tension will point towards their foundation. If the word "parallel" is used in the computational process, or some other process task, you can use "serial" as oposit of "parallel". My computer can process 8 tasks in parallel. My computer has an serial processor. Of or arranged like rays or the radii of a circle; diverging in lines from a common centre. In electricity the opposite of "parallel" is "series" relative to connections. It would also apply to these towers as they appear in series along the bridge roadway. "Converging" would the most apt descriptor for "not parallel" in my opinion, as geometrically speaking any lines which are not parallel can accurately be said to converge or diverge. What is the opposite of “parallel”? What do you call this kind of entrance with a roof? What is the opposite of a grazing angle? What is the opposite of “strategic”? When there stand two things, we call they stand “in parallel,” what do you call three or more things stand “in triangle”? Is there a word for the parallel world of dictators?